Experts said the US numbers were “somewhat pessimistic”. The world’s largest outbreak of Ebola has caused 2,800 deaths so far, mainly in Guinea, Liberia and Sierra Leone. 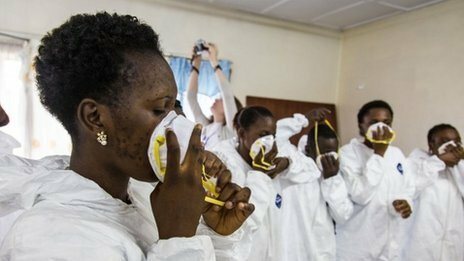 More than 160 NHS staff have volunteered for UK efforts to help in the outbreak. Chief medical officer for England, Prof Dame Sally Davies, confirmed that the British nurse who survived Ebola, William Pooley, has volunteered to give blood that could help treat patients. The Sierra Leone army has sealed off the country’s border with Guinea and Liberia in a bid to control the spread of Ebola. British military and humanitarian staff have arrived in Freetown to oversee the construction of the UK’s medical facility and assist with the response to the outbreak. Scientists have warned that swift action is needed to curb the exponential climb in the Ebola outbreak.Two new estimates suggest that cases of Ebola could soar dramatically in the three countries with the majority of cases.Projections published in The New England Journal of Medicine predict that by early November there will have been nearly 20,000 cases.The analysis of confirmed cases also suggests death rates are higher than previously reported at about 70% of all cases, rather than 50%.Dr Christopher Dye, Director of Strategy for WHO, said unless control measures improved quickly “these three countries will soon be reporting thousands of cases and deaths each week, projections that are similar to those of the Centers for Disease Control and Prevention (CDC)”. Posted on 23rd September 2014 by newsafrica. This entry was posted in Africa, Ebola, Health, United Nations, WHO and tagged Centers for Disease Control and Prevention, Christopher Dye, Ebola, Liberia, New England Journal of Medicine, Sierra Leone, West Africa, World Health Organization. Bookmark the permalink.